I have been backpacking for over 20 years throughout Indiana, Ohio, Kentucky and most recently in Western USA. In addition to backpacking I enjoy family camping with my wife and kids and being outdoors in general. I would describe myself as a mid weight backpacker. I use fairly light weight equipment and gear but still like to bring more than the bare essentials with me while on the trail. 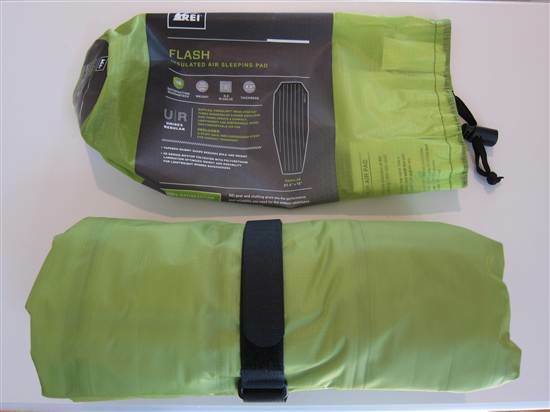 The REI Flash Sleeping Pad is a lightweight, inflatable air mattress with Primaloft insulated baffles (tubes) for increased warmth. It is available in two sizes: Regular and Long. I am testing the Regular size. The Flash is made of ripstop polyester with 8 tubes that run lengthwise to form a tapered, mummy-shape design. The six inner tubes are 2.5 inches (6.3 cm) in diameter while the two outer tubes are slightly larger in diameter. The regular size pad is 72 inches (183 cm) long, 20.5 inches (52 cm) at its widest point and 2.5 inches (6.3 cm) thick. When packed in its stuff sack the Flash is 4 inches (10 cm) in diameter x 9 inches (23 cm) long. My initial impression of the Flash sleeping pad was very positive. It is light green in color and very light weight at 1 lb (0.45 kg). While rolled up in its stuff sack it is roughly the size of a Nalgene water bottle. Having backpacked for many years with a self inflatable sleeping pad that was so large it had to be strapped to the outside of my pack, there is no doubt that this is a welcome addition to my gear. The polyester fabric feels smooth to the touch but also very thin. I'll admit that I am somewhat concerned about its ability to withstand pokes and prods by sticks and other sharp objects on the forest floor. For peace of mind, I wish REI would have included a repair kit in case of a leak or puncture. As it stands, a repair kit can be purchased from their website or at one of their local stores. There are two valves on the Flash, one for inflating the sleeping pad and the second for deflating it (see photos below). Instructions are printed on a tag that is located inside the stuff sack. 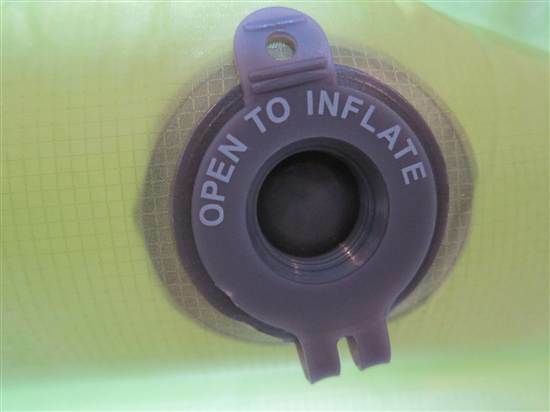 They read as follows: "To inflate: Open the inflation valve and blow (or pump, if your pad has an integrated pump) until the pad becomes firm. Close valve once the pad is fully inflated. 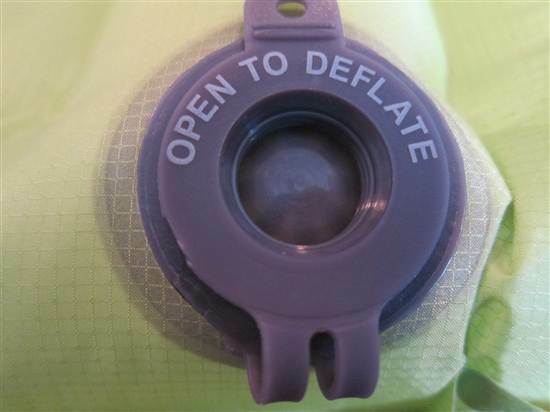 To deflate: Open the deflation valve. On a smooth surface cleared of sharp sticks or stones, roll (or fold) pad toward valve until all air is forced out. Close valve(s)." Cleaning instructions are located on the back of the tag. I found it quite easy to inflate the Flash sleeping pad. It took me 16 breaths and about 1 minute to inflate it completely. During this time, the one-way valve did a great job of sealing the air so none leaked out in between breathes. 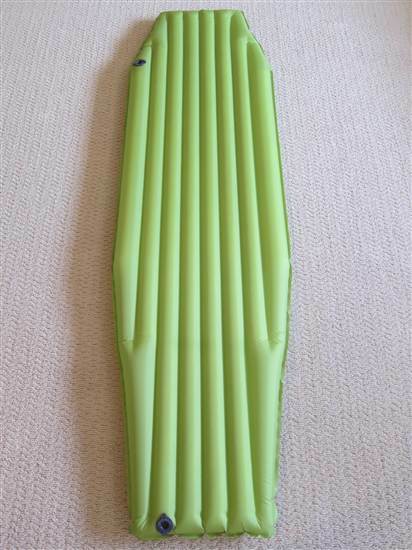 Once inflated the sleeping pad felt firm and stable. Although my knees 'bottomed out' the pad where I knelt down on it, the Flash quickly distributed my weight as soon as I laid down. The Flash felt quite comfortable as I laid on it, so much so that I didn't want to get up back up again. I also found that the Flash was easy to deflate by simply opening the deflation valve. The air exited almost instantly. Finally I folded it in thirds lengthwise, the same way it was originally packed and began rolling it up. Once fitted with the compression strap it easily fit in the included stuff sack. The Flash is lightweight and small enough that it should be perfect for three season backpacking as long as it is tough enough to withstand extended backcountry use. The Flash is impressively lightweight and comfortable to lie on. In addition, I really like how compact it becomes when rolled up. If it proves to be durable and warm in the field, this mattress will be a real winner for me. This concludes my Initial Report of the REI Flash sleeping pad. During the past two months I have used the REI Flash Sleeping Pad on two backpacking trips for a total of four nights. My outings included a three-night trip to Southern Indiana where we had great weather with sunny skies and temperatures in the mid 70's F (23 C). My second outing was an overnight trip to the Charles Deem Wilderness where I hiked several loop trails for a total of 16 miles (26 km). The weather on this trip was cool with occasionally strong breezes. 1. We hiked, fished and waded through creeks looking for tadpoles on this family camping trip to Southern Indiana. The terrain was hilly with lots of open and forested areas to explore. 2. My second trip was to the Charles Deem Wilderness. During this two-day outing I hiked on established trails covering 16 miles (26 km) across moderately hilly terrain. Elevations ranged from 570 ft (174 m) to 780 ft (238 m) and daytime temperatures were in the mid 60's F (19 C). Why didn't I make the switch earlier? Certainly lightweight sleeping pads have been on the market for several years and are available from a number of manufacturers. My excuse for not getting one sooner was always that an inflatable air mattress couldn't survive the rigors of backpacking. Every time I considered buying a new pad, my mind conjured up images of me lying wide awake in the backcountry at 4am in the morning on a deflated, puncture ridden air mattress. In addition, I couldn't imagine it being comfortable or even remotely insulative, compared to a thick, self-inflatable foam core pad. Fast forward two months and the REI Flash is my go-to sleeping pad. As a matter of fact, I store it in my backpack so the thought of not taking it with me doesn't even cross my mind. As an added benefit, because it takes up so little space, I'm able to use a smaller backpack for most of my outings. The one way inflation valve is great. It only takes me 15 or so breathes to fully inflate the pad and I can stop whenever I want without worrying that air will escape. I also love the fact that it's incredibly easy to deflate and store. Pulling the deflation valve immediately releases all of the air from the Flash so that I can quickly pack it up and get going. Since I'm not a large person, the width and length of the pad has not been a problem for me at all. I am able to fit my entire body on the Flash and it easily supports my weight. On my three-night campout this test period, the Flash stayed inflated the entire time and lost very little air. Finally, although I first considered the larger tubes on the perimeter of the Flash to be marketing hype, I have found they work as advertised, keeping me from sliding or rolling off the edge of the pad at night. Both of my trips this fall have been in warm weather so I haven't had the opportunity yet to test how well the Flash insulates my body from cold or frozen ground. Hopefully it will perform well as I'd really like to be able to use it year-round. Regarding the ruggedness of its polyester fabric, only time will tell. I am, however, still extra careful to pick up or move any loose rocks or sticks before pitching my tent. I really like the REI Flash sleeping pad. 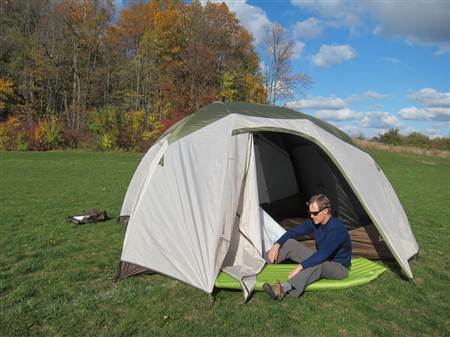 It is lightweight, compact, easy to inflate, comfortable to sleep on and very quick to deflate and pack. So far I have had no problems with its durability. Stay tuned to find out how well it insulates in cold weather. For this and more, please stop back in two months for my Long Term test. This concludes my Field Report. During the past two months I used the Flash on two additional backpacking trips for a total of three nights. My outings included a two backpacking night trip to the Hoosier National Forest in Southern Indiana where skies were partly sunny and there was 4 in (10cm) of snow on the ground. My second outing was an overnight camping trip where I hunkered down in freezing temperatures as 13 in (33 cm) of snow fell around me. 1. My first trip was to the Hoosier National Forest. During this two-day outing I hiked on and off trails covering approximately 8 miles (13 km) over moderately hilly terrain. Snow and slippery trails slowed my travels considerably. Elevations ranged from 505 ft (154 m) to 760 ft (232 m) and daytime temperatures were in the low 30's F (0 C). 2. My second outing was an overnight camping trip only 12 miles (19 km ) from my home. Central Indiana was getting ready to be hit by one of the worst winter storms we've had in years and I couldn't pass up the opportunity to try out this sleeping pad in really cold, snowy conditions. Although it might not have been realistic to think that the Flash could keep me warm in these conditions, I felt the need to find out. I pitched my tent in a small valley amongst a number of spruce trees to protect myself from the snow and wind as much as possible. Read further to find out how I fared. For the most part, Long Term Testing has reaffirmed what I said previously about the REI Flash sleeping pad. When packed it is extremely small and lightweight and this has made hauling my pack so much more enjoyable. I am constantly reminded of this when going off-trail through thickets and up steep ridges. It's remarkable how much more balanced I am now that my previous pad is no longer hanging perilously off the back of my backpack. While hiking through the Hoosier National Forest last month on slippery snow packed trails I was never concerned about my pack weight shifting and causing me to lose balance. I also found it much easier to forge up steep ravines with my pack load centered on my back and up close against my body. During the past four months I've had no durability issues with the Flash (although I must admit I have coddled it). I have also had no leaks or valve issues per se. In fact my sleeping pad still looks brand new with no visible signs of wear or dirt from field use. The only problem I have experienced, and this was in zero degree weather, was reduced inflation of the pad four hours after blowing it up. This happened on my second outing when I awoke in the middle of the night and realized I was lying firmly on the ground. I must say however that what was going here was simple Chemistry and would have happened to any inflatable pad in these conditions. In fact I am quite confident the REI will continue to perform without fault for many more years with no regular maintenance. Speaking of inflation, I have not gotten any faster at inflating the Flash throughout this test period. However, the time it takes me to blow up the pad is quite minimal, one to two minutes at most, and so it's not a hassle at all. I love having the separate inflate and deflate valves and find that the Flash is very easy to pack away; in fact in freezing conditions it is orders of magnitude easier to deflate and store than my self-inflatable mat. Last weekend there was a major snow storm in the Midwest and extreme cold temperatures throughout the USA. 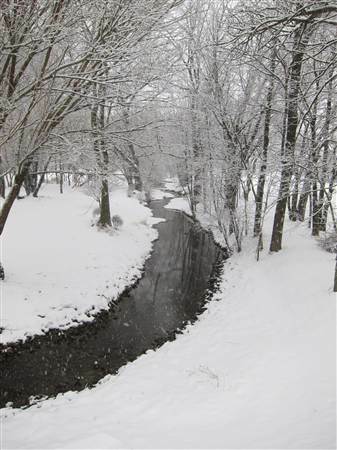 Central Indiana got a record 13 in (33 cm) of snow fall. It was during this time that I took the Flash on a true winter test, the purpose of which was to find out how effective the sleeping pad would be in less than ideal conditions. I resolved myself to stay out all night if possible, knowing my car was only a quarter mile (0.40 km) away if needed. I had tested the pad in 20 F (-7 C) weather a few weeks prior and felt like I'd have a decent chance of making it through the night as long as my sleeping bag held out. What I discovered about 3:30 am was that the Flash was not suitable for these conditions. Temperatures had dropped during the night to -7 F (-21 C) and wind chill was -22 F (-30 C). After a few hours of shivering, I packed up camp early at 6:15am and headed home for a long, warm shower. I have been very impressed with the REI Flash sleeping pad and would highly recommend it to family and friends. It's main selling points for me are its lightweight design and compact storage size. Although I have had no issues with durability, as with most ultra light gear, I will continue to take extra care in handling and using it. After sleeping on it in both warm and cold weather conditions my plan is to use it mainly for three season camping and bring along a foam mat for added insulation whenever I use it in temperatures below 20 F (-7 C). This concludes my Long Term Report and this test call. Thanks to REI and BackpackGearTest.org for the opportunity to test the Flash sleeping pad.